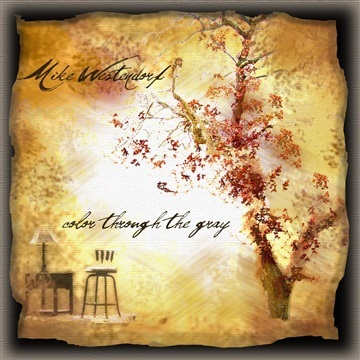 Raw and intimate, soft and restless, "Color Through the Gray", Mike Westendorf's latest project, is full of longing and of sweet satisfaction. It is a paradox of feelings that does a great job of portraying the emotions involved in the pursuit of God. A yearning of the soul; that while it is an ever present hunger and thirst for more - there are still moments of great satisfaction when the Creator turns His gaze our way. The opening guitar chord in "Come" drones through the first track with a relentless pulse that pulls the listener into a fantastic journey. The lyrics "Come all ye who mourn, come all ye who fear, come all ye who sing for joy" open the album with an invitation to anyone to have a real encounter with Jesus Himself. Guitarist Rick Yocum's playing is powerfully executed in these tracks. My favorite types of records are those that leave production at the door and invite the listener into a private room where the artist bares his or her soul. Mike accomplishes this with ease. There are moments, while listening, that you forget where you are and all of the problems that exist in your world and you just let the music bare itself to you in such a completely honest and pure way. The guitars on each track are very reminiscent of Don Mclean, Neil Young, James Taylor and other great pickers of the last three decades. This record is certainly in good company. The title track, "Color Through the Gray" is a song that expresses the need for us to find fulfillment and hope even in the most mundane of circumstances. "What happened to the rainbow that I used to know; what a show. What do I owe to see it once again, to have the chance to see it once again." Mike manages to achieve a sound that is purely acoustic and ethereal at the same time. It may remind some of the deeper thinkers who listen to this record of the irony involved with our flesh coming in contact with something Divine - something supernatural. The arrangements are simple and easy to grasp yet lyrically deep and fulfilling. This is a great worship album. As each song played I found myself wanting to worship God in my own secret place - something that is absent in much of Contemporary Christian music today. You can certainly hear Mike's desire to worship His God and his invitation to his listeners to do the same. "Be still" God calls to each of us. "Be still and know." The messenger in "Color Through the Gray" knows, and wants to share a little of that knowledge with you.